The socks. The hat. The accent. What did Robert Muldoon have in Jurassic Park that you don’t recall immediately? The game warden from Kenya was a man of high intellect. He had seen raptors at their most curious stages (for example, testing the electric fences for weaknesses), and I’m sure at their most admirable stages as well. He was taken out of the franchise too soon, and although I’m honestly not sure where else he would have fit in down the road, I think the possibility to see him again could have been there. What Steven Spielberg did with Bob Peck’s outstanding character is genius. Sadly, on April 4th this year, it will have been 19 years since Bob Peck passed away from cancer. To honor his memory, let’s briefly discuss the stellar job he did with this character and why Robert Muldoon is a JP legend. A common theme throughout most of the JP franchise is that good guys live and bad ones meet their ultimate demise. In fact, sometimes you don’t have to be a “bad guy” to seal your fate in this series — all you need is a lack of respect for the power of dinosaurs. If you see them as assets or look at them with dollar signs (I’m thinking of you, toilet boy), then you’re most likely as good as dead. Nedry, Genaro, Ludlow, Hoskins, Dieter Stark (with a particularly brutal and prolonged death); all met ends that seemed to make sense. They all had agendas that looked past the fact that these were big, powerful and living animals that deserved to be treated with more respect. One of them in particular, Dieter Stark, had a well-deserved death — death by what seemed to be a thousand compys eating him alive for zapping one of their own with a taser for no reason. Other deaths came as a slight surprise. The character wasn’t money hungry, he or she didn’t not respect the animals. They were simply expendable, I guess. Think of Eddie Carr, Udesky and Zara. Eddie went out a hero, trying to save his new friends. I find his death to be one of the more depressing endings of a character in the JP universe. Udesky was just trying to help find a child. The worst thing Zara did was not pay better attention to her boss’ nephews. There are more of these types of deaths out there, but those are the ones that come to my mind first. One of the reasons that Jurassic Park got this franchise started on such a powerful note is because some things happened that you never saw coming, including the death of Muldoon. You may have guessed that Genaro would die — but by being plucked off the toilet? Not many could have guessed that, I’m sure. When Nedry met his end (which I still find to be a particularly disturbing scene, bravo Mr. Spielberg), I knew it had to be done. He had caused so much destruction and loss of life due to his greed. But when he got back in his Jeep, I thought he had bought himself just a little more time. I was wrong. And who could have predicted Ray Arnold’s arm giving Ellie the surprise of her life? And then there’s Muldoon. Muldoon had so much respect for these animals. It gives me shivers when he is crouching past the raptor enclosure with Ellie and he sees that they’ve escaped. The terror in his eyes and voice is unforgettable. Never once did we ever get the slightest hint that he cared about money. He didn’t want to see harm inflicted on a single person. He was genuinely angry that locking mechanisms had not yet been put on the vehicle doors, as an example of that. In the end, he gave his life to save Ellie’s and ultimately, the rest of the survivors. I still even find myself wondering if he was serious or sarcastic when he told the main group, “they should all be destroyed,” referring to the raptors. He watched Jophery die. He knew what these creatures were capable of and didn’t deserve what he was given. With Muldoon, Spielberg had to make his audience understand that in this universe no one was truly safe. Respectful or not, these animals were vicious, cutthroat and your attitude towards them meant nothing in the end. The way he died was perfectly executed; he went out in a legendary way. The comfort that JP fans can take in his death is that he looked his predator in the eyes. He even got to acknowledge her intelligence and her hunting ability. In essence, when he gave us his last line, “clever girl,” he was basically saying, “Well done girl, you got me. Respect.” After that point, it’s best to not listen, because the JP legend goes down in a horrifying and undeserved way. Jurassic Park is a fierce franchise with even more to come. Henry Wu is going to have a grisly end, you can bet on that. The theme of the first movie carries over through every installment of the series. That theme is that just because you made them, doesn’t mean these living creatures are mindless assets. Mills, Wheaton and others in Fallen Kingdom, like Hoskins, don’t get that. It’s probably a safe bet that they won’t make it out either. As Owen once said, “They’re alive. They’re thinkin’.. I gotta eat. I gotta hunt,” and, well, you know the rest. What do you think? Do you think of Muldoon as a legendary JP character? Let us know your thoughts below! If you’d like to discuss any and all thing JP with me, follow me on Twitter! I think Muldoon’s death helped solidify that it doesn’t matter if you ‘deserve’ to get chomped, but that these creatures are so dangerous that anyone could get killed by them. It really heightens that sense of fear/dread that any one of these animals could be around any corner. Agreed, knocks down another pillar holding up the illusion of control (like Masrani’s death). Though I do wish we could have more of this character, I wouldn’t have wanted it any other way. Definitely Muldoon is legendary, his famous line “Clever Girl” is delivered perfectly in that scene. Although, I wish we could have seen him put up a bit of a fight with that raptor. But, definitely what I appreciated more about the first three movies was the fear instilled in you that you would be in the dinosaurs’ territory. I just hope that is conserved in the upcoming sequels. Horror is a step in the right direction, but we don’t really need hero and villain dinosaur all the time. I prefer to see something more in the lines of 2005 King Kong where Anne Darrow leaves a log to find a V. Rex staring at her. It’s simple, but terrifying. Personally, I think putting up a fight with the raptor would have undermined the respect he had for them. Definitely a legendary, badass character. But what I think his death does more than anything, is show that even the person who is most prepared physically and most prepared mentally (being around the raptors since they were babies and knowing their tendencies) is still no match for this predator. His “clever girl” line is great not because it’s a memorable one liner (it is) but because when put together with his entry scene where he describes the raptors, it shows a respect and rivalry I think he had with the lead raptor. He’s a great character, one of my favorites after Grant and Malcom. YES! Muldoon is definitely a legendary jp character. Muldoon was always my favorite character. And I didn’t think he deserved his death. I’m the book he actually lives. And was plenty more badass at that. Hold on to your butts…characters die in JP whether you deem they deserve it or not. It’s a movie. Muldoon didn’t die. He and the “Big One” talked out their differences and parted ways amicably. Then, when the helicopter left him stranded on Nublar, he thought “meh” and just decided to live there. Exactly. Plenty of food there now. No ice cream tho. Here we go with the whole ‘they didn’t deserve THAT’ in films. It’s RUBBISH! Dangerous animals escape. Dangerous animals attack. People die. Good and bad or whether they deserved it or not is completely and utterly IRRELEVANT. Sh/t happens. Deal with it. Robert Muldoon FEARED the Raptors. He HATED them and wanted them dead. The Raptors were intelligent and were subjected to abuse as a result of Muldoon’s inexperience with them. No wonder the Big One had a chip on her shoulder. And then there’s Zara’s death. Everyone whinged and stated that she didn’t deserve it. But actually her death was the most realistic thing to happen in the whole damn film. Innocent people suffer and die, that is life. For once, I agree with what you say. I also think that the ‘they deserved to die’ or ‘he/she didn’t deserve to die that way’ is soooo stupid in movies like the JP films. As if these hungry, predatory animals care if someone deserves it or not to be killed by them! Muldoon’s death made sense in the film and was appropriate. His death had a lot of meaning. Zara’s on the other hand was over the top and odd. I think they were going for something with her being miserable since you hear snippets of her phone calls… but like most things in JW it didn’t work. They really showed a lot more people getting eaten by escaping dinosaurs instead of just her. I think Muldoon’s death was dumb and out of character. He knew how the raptors hunt in groups (and if I’m remembering right, he also knows a lot about the raptors behavior in the book) and still he’s focusing on and aiming his gun on the one raptor he sees right in front of him (who is not even looking back at him) and completely ignoring the fact (or forgetting the fact) that there most probably are other raptors in the jungle at both sides of him, hunting him down. Again, so out of character. Especially because he tells Ellie just before this all that the raptors have already seen them are are hunting them. Even after seeing Jurassic Park about 50 times I still think his death is out of character. Zara’s death I still enjoy every time I see it. This death seems way more realistic in my eyes. Yes, maybe it looks a bit overdone because the filmmakers are zooming in on her death so much in the midst of all the chaos that’s happening. But in a chaos like this it is highly possible that a person gets picked up by one of the many escaped Pteranodons and is dropped in the water. Maybe they could’ve cut the Pteranodon trying to pluck her out of the water out, because this feels a bit overdone (the Pteranodon could’ve easily left her there, picking another person from the fleeing crowd), but I think and feel that Zara’s death could’ve happened when this was real. It should’ve been more believable when they showed other visitors being carried off by Pteranodon too though. “Sh_t happens” is not how you tell a story. If JP/JW were documentaries, then yes, noone deserves what happens. But it’s a work of fiction we are told. We are supposed to feel the characters, we can root for them or oppose them. We want them to be rewarded if we like them or punished if we don’t. Then, and maybe only then, are we touched by events that go beyond these boundaries. Eddie’s death shocked us because normally good guys survive. They are like friends to us, so if they die, it affects us. Zara’s death on the other hand was totally random, it didn’t do anything to advance the plot. It didn’t shock us because we were attached to her, it shocked us because it was random and useless. That’s just bad storytelling. For sure, anything can happen. But if you start thinking that way, Hoskins could have survived, Nedry could have survived and especially Ludlow should have survived (because he can’t really be so stupid). You see, they didn’t, and they met their demise for a reason. Ultimately Zara’s death served to remind us that the Mosasaur existed at the end of act 2, so that… *ahem spoiler*… so that the end of act 3 didn’t feel like a Deus ex Mosasaur, sorry Machina. Wether or not that she deserved it shouldn’t really be a question. That’s not to say that I didn’t feel the unfairness of her death in my gut for a good while afterwards. Great article. I loved Muldoon, but his demise made the intensity of the final scenes so much greater. No one was safe. RIP Bob! Although I love the character of Muldoon, and he’s given some of the best quotes of the film, his death scene always frustrated me, even as a kid. Muldoon is the leading expert on raptors. Hammond even says so. Unlike Grant, he’s seen them in the flesh, observed their behaviour, and knows full well what their capable of. Therefore, I found it rather unbelievable that he wouldn’t have anticipated an attack from the side when he was hunting the raptor. He knows how clever they are and he knows they hunt in packs. When The Big One attacked from the side, even as a kid, I was like ‘duh’. I would have like Muldoon to have anticipated the side attack but then maybe the raptors attacked from behind or tricked him in some other way. Something even he had never seen before. 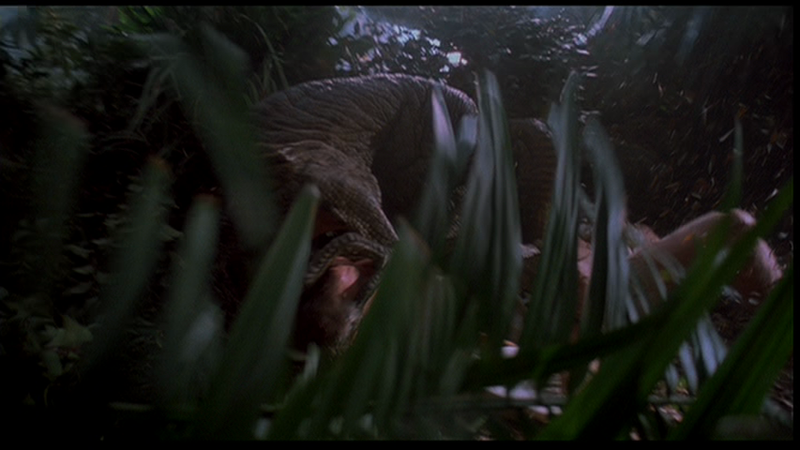 Then The Big One would truly haved earned his remark: “Clever girl”. That’s exactly what happened, though! It’s one of the most misunderstood scenes in the franchise. Muldoon thought he had the drop on the raptors, that he was taking them completely unawares. Notice how the one he’s aiming at doesn’t seem to know he’s there. The Big One’s attack showed they’d actually baited him into a trap. He knew he’d be attacked from the side, but in this circumstance, he wasn’t expecting an attack at all – that’s what was clever about it. The raptors were so smart, they were capable of playing dumb. Thanks for the reply 🙂 Apologies but, with genuine respect, I think it’s you who could do with a better appreciation/understanding of the scene. Just before Ellie makes a dash for the maintenance shed, Muldoon tells her “we’re being hunted”. He knows that the raptors are hunting them AND he knows how many raptors there are (3). He would most definitely be expecting an attack, and it would be incredibly out-of-character for him to underestimate the raptors. I’m afraid this is at odds with your interpretation of the scene, e.g. “in this circumstance, he wasn’t expecting an attack at all”. He was a legendary character for sure but the way he went out was just not right. In the beginning of the movie Alan Grant explains to the kid how raptors hunt by one staring at you in front of you and the others attacking from the side, as they hunt in packs… But the park raptor expert doesn’t know this? Isn’t the whole point that these are animals, not monsters, and they don’t kill for drama? Anyway, I always loved the theory that Muldoon survived the incident, because the raptors were only toying with him. Of course that would leave him terribly injured and possibly disfigured, but we’ve seen it with tigers and lions that grow up in captivity. When they attack their trainers in a save environment the consequences might be fatal but they don’t hunt or kill because they feel threatened. So if they wanted to bring back Muldoon, that’s the way they could have done it. Sadly, Bob Peck’s untimely death made it impossible anyway. So if they brought him back in a later installment, it probably would have been as some kind of prophet who warns the people of the creatures they bred. Like he did in JP, but in a different scenario. I don’t see him train animals or educate animal handlers or as an office guy either. But since Malcolm and Grant did exactly that, I don’t know where Muldoon would fit now. Especially as he would have aged since JP1, of course. He should have picked up the M-16. Not the Spaz shotgun. You do NOT want to fight raptors at close range. Too risky. Muldoon was definitely a great character and deserves his spot in the hall of fame. Despite his unpreparedness in the end he was in fact one of the most competent employees in the park in how he had his own way of measuring the animal’s behavior traits. He wasn’t naivé like Hammond. Now that you mention it, I also felt bad for Arnold in a similar way. He did his best to try and bring the park back online and instead met a grizzly end trying to do just that. Muldoon was my favourite character too! I am sure I read somewhere that his death was symbolic as a ‘great white hunter’, much like Roland in the Lost World (Roland’s character arc was fleshed out though, obviously). Muldoon’s is linked to ideas in the book about control and arrogance towards nature. Despite his serious approach towards the dinosaurs, he still thinks the humans ultimately have control over them. Whilst the likes of Ray Arnold were over-confident in technology and Wu in his over-confidence as a scientist, Muldoon was over-confident in his ability as a hunter and relished the challenge of hunting a raptor in the open. He was definitely enjoying the situation he found himself in (!) trying to outsmart the raptors, otherwise he would’ve (and probably should’ve) stuck with Sattler the whole time. Definitely a legendary character, especially in the book. He is easily one of my favorite characters from the franchise. Of all the Characters that died, his death made the least sense. However, there’s obviously a huge difference between observing the raptors in captivity and hunting them on an even playing field. I love that you guys brought this up because it is something I have often wondered myself as I re-watch the first film. He didn’t die in the Novel. He is one of my favorite characters but I see why he died in the movie. I’m still sad though. The actor died too though, which is unfortunate. If seeking a film style justice for Muldoons death is there, and perhaps of the most “earned” of all characters ever in JP. Remember, Muldoon, the big game hunter from Africa. Though we dont know the details of Muldoons career, it is a considerable stretch to think it did not involve killing endangered species, and if not for the sake of thrill etc.–it would be ultimately to the benefit of human or humans. The line Muldoon says, “They should all be destroyed” surely is not sarcastic, more likely one of the many fervent suggestions Hammond ignores. Even if Muldoon had changed to a wildlife conservatist preceeding JP, he would have been well aware that the introduction of new (especially dangerous) organisms is terribly irresponsible–and threat nearly all life on the island or greater. Really I cant stand film justice when its executed by forces which have no concept of retribute. That’s Spielberg for you. A lot of characterizations and outcomes in the movie were the exact opposite to how they were in the book. He survives in the novel. He is one of my favorite characters too, but I can see why he died. In my opinion, Muldoon’s death was the most horrifying death in the entire series to this date. I was always fascinated with how that shot was filmed, you can actually see the Raptor gnawing on Muldoon’s head. It’s like something that belongs in a Rated R film, but because it’s covered so cleverly by moving bushes, and it all happens so fast, you can’t really see the details. But that’s what makes that shot so horrifying, it leaves the details to your imagination. I don’t actually wanna see poor Muldoon’s head being munched on by sharp teeth, but I’m picturing it while you can hear him screaming. No other death in the franchise has ever come close for me to being as disturbing as Muldoon’s. The best part is, that it required absolutely no CGI, and in that moment, that Raptor really comes to life. In Jurassic World, every victim is killed by a CGI cartoon dinosaur. I’d like to see more deaths in Fallen Kingdom shot more creatively using more prosthetic / animatronic carnivores. However, I will say, the best CGI death was Genaro off the toilet. Lost World had the highest death toll, but alot of them happened off screen, with the exception of Eddie Carr. In the end, Muldoon’s death was all part of the magic of the first movie, I would just like to see more of that in the rest of the series. It always bothered me that he survived in the book yet died in the movie. I think Muldoon’s death was perfect. I was 11 when I first saw it, and for some reason his death surprised me the least… He gives the impression from the outset that he’s the sort of guy who would give his life to save others. In other news. Fallen Kingdom toys are available on ebay U.S already. And are triple the price they will be in stores for us unfortunate Aussies still waiting. The scalpers have already begun. Over $210 AUD for a Collosal Rex. And the seller has sold over 80 already. These people are scum. A good article is undermined by a bad headline. I didn’t really understand Robert Muldoon as a character when I was a kid – I remembered a lot of his sequences, but I couldn’t place who he was. He was just above the veterinarian Dr. Harding or the genetecist Dr. Wu – another memorable employee that served a purpose in-universe, but they didn’t feel like they had personality. As an adult, I appreciate him more, but I would dare say that’s because of the same quality that bored meas a child – you don’t really know who he is for sure, adding a level of mystique to the character. He’s a big game hunter who clearly has respect for nature. Perhaps he is the traditional archetype of a big game hunter, someone who merely enjoys a healthy challenge, or maybe he’s more of the conservationist hunter archetype never personified better than by Theodore Roosevelt himself. Two totally different ideas for a character, because we’re given enough light detail to construct our own conception of who he is, but nothing is too assured. I see it as a way to make the dinosaurs seem more powerful than guns and the security measures put in place. At the beginning Muldoon shouts ‘shoot her!’, but they weren’t able to. Then he spends a fair few moments getting his gun ready to shoot the raptor, but it was useless. Then you can hear shots through the phone before Hammond screams ‘GRANNNNNT!’. There were security measures put in place, with Muldoon being the head of these. Hammond ” presumed the worst case scenarios will be the same as those from African predators. However dinosaurs are far more dangerous than they had planned for. I believe it shows another layer of Hammond’s ineptitude and Muldoon, head of security, had to die to demonstrate this. I have always wondered why Sattler didn’t warn Muldoon that raptors trick you when they hunt and that the one in front of you is the distraction. I mean she was there when Grant made that point to the kid in the beginning, no? 1- Muldoon’s gun should have already been “hot” and he should have already been in combat mode like Owen is constantly. 2- JP1 is really an anomaly in the series. It was a true classic that the others will never match. It was extremely deep. It had that Michael Crichton sense of dread and mental horror. That’s why Muldoon was killed even though he survived in the novel. Crichton was involved with the screenplay and obviously approved of the death. 3- After seeing how the franchise blew up of course they regret killing him off. He was a valuable character, that’s why Wu is still around.